In the last 30 years, China’s record economic growth lifted half a billion people out of poverty, with rapid urbanization providing abundant labor, cheap land, and good infrastructure. While China has avoided some of the common ills of urbanization, strains are showing as inefficient land development leads to urban sprawl and ghost towns, pollution threatens people’s health, and farmland and water resources are becoming scarce. With China’s urban population projected to rise to about one billion – or close to 70 percent of the country’s population – by 2030, China’s leaders are seeking a more coordinated urbanization process. Urban China is a joint research report by a team from the World Bank and the Development Research Center of China’s State Council which was established to address the challenges and opportunities of urbanization in China and to help China forge a new model of urbanization. The report takes as its point of departure the conviction that China's urbanization can become more efficient, inclusive, and sustainable. However, it stresses that achieving this vision will require strong support from both government and the markets for policy reforms in a number of area. Because most of the urban expansion in recent years was on converted rural land, the report says currently the amount of farmland available is close to the “red line” of 120 million hectares, which is considered to be the minimum necessary to ensure food security. More efficient use of land will require stronger property rights for farmers, higher compensation for land requisition, new mechanisms for converting rural construction land to urban uses, and market-driven pricing for urban land allocation. Legal limits should be set up on rural land taken for public purposes by local governments. The system should remove barriers to labor mobility from rural to urban areas, as well as between cities, to help boost workers’ wages. The report recommends moving to a revenue system that would ensure a higher portion of local expenditures is financed by local revenues, such as property taxes and higher charges for urban services. In cities, basing the government prices for industrial land on market value can encourage land-intensive industries to move to smaller, secondary cities. Cities can also make better use of existing urban land through flexible zoning, with smaller plots and more mixed land use, which would lead to denser and more efficient urban development. Linking transport infrastructure with urban centers and promoting coordination among cities would encourage better management of congestion and pollution. China already has tough environmental laws, regulations and standards, so the most important task for achieving greener urbanization is enforcement. Market-based tools, such as taxes and trading systems for carbon, air and water pollution, and energy, can also be used more to meet environmental targets. 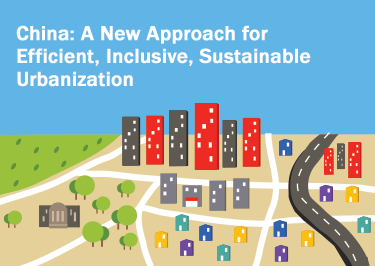 The performance evaluation system of local officials could be adjusted to give greater incentives for a more efficient, inclusive and sustainable urbanization process. The slump in China's property market looks to be accelerating with new home prices last month falling at the fastest pace on record. The sector is emblematic of problems such as rapid credit expansion and policies that promote short term growth over a more balanced economy. House prices in the major cities surveyed by the National Bureau of Statistics, fell on average by 5.7 per cent compared to February last year. It's the sixth consecutive month house prices have fallen, including drops of 5.1 per cent in the year to January and 4.3 per cent in December. Only one city of the 70 surveyed saw any increase in house prices. Representing between 20-25% of the economy, the government however, still believes that the increased pace of urbanization will stabablize the declines this year: however, perhaps, China has simply built too much? Provincial governments meanwhile, will have to be persuaded to reduce their dependency on their sales of state owned lands to the developers: which will be no easy task since some estimates put this at around 40% of their annual revenue. A further concern is the effect on property developers (still supplying over 15m housing units a year), who will be caught in a situation of tight cash flow, which is bound to churn up the shadow banking sector in China: the sector is largely built on implicit guarantees and any meaningful defaults there may jeopardize the stability of the financial system. When developers are limited access to credit, they have to reduce prices to unload their unsold housing units (and pay back their debts), which gives investors second thoughts about whether to continue plowing their money into property, starting a deflationary spiral. Falling asset prices undercut the basis for both past and future lending. However a saving grace is that Chinese households continue to have a relatively low level of household debt, due to large mortgage down payments (China buys in cash, in full). 2015 is likely to be a choppy period for China, as we see the realities of President Xi Jinping's "New Normal".